The pattern, on the exterior of the bowl only, consists of a series loops with "feathers" between some of the loops. I have no idea who made it. A rare pattern, but not paricularly desirable. 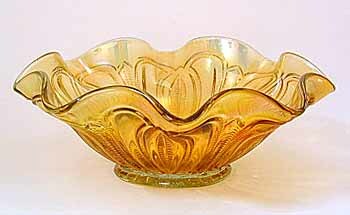 Marigold bowls sold in 2010 for $15, 2012 for $3, 2014 for $10, and 2017 for $20.